Toronto Stock Exchange (TSX) has developed into one of the world’s leading securities exchanges with a market capitalisation of over US$1 trillion and is host to some of the world’s most influential corporations. However, when you zero in on the mining sector, TSX and TSX Venture Exchange (TSXV) dominate the landscape for raising capital and listing new issuers thanks to a highly structured and well established regulatory, financial and political ‘ecosystem’. Ecosystem is the keyword when it comes to Canada’s exchanges. Ungad Chadda, president of capital formation, equity capital markets, at TMX Group, the holding company for the boards, says the comprehensive environment for mining companies that exists in Canada, which has been expertly crafted by regulatory bodies and successive governments, makes the TSX/TSXV ‘the place to list’ for mining companies. “There is no other place to be – particularly for exploration and development companies and prospecting companies. When people want to raise significant dollars they use our platform to attract and access both the Canadian and international buy side,” explains Chadda. 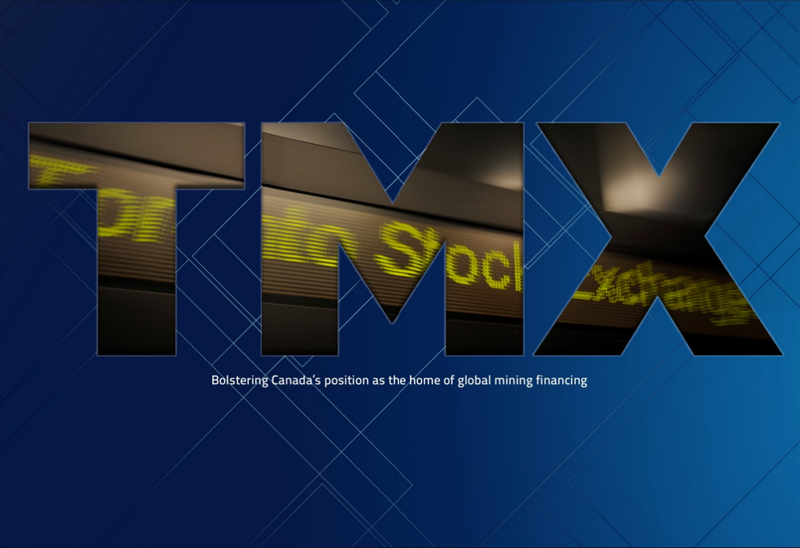 The numbers speak for themselves for the mining sector on Canada’s exchanges; 57% of all global mining financings took place on TSX and TSXV in 2016, and last year also saw around 64 billion mining shares traded on TSX/TSXV with a total value of $263 billion. TSX has long been an established top-tier exchange attracting the biggest mining companies in the world as well as capital from huge international funds. Chadda attributes that to the implementation of robust regulatory processes such as the NI 43-101, as well as the quality protocols for new companies on the exchange. The internationalisation of the brand has been a major driver behind new capital coming in. Nowadays on average, with a large transaction of $30 million plus, 50% of the capital is coming from Canada, 25% from the US and the final 25% from abroad, which usually means Europe. That balance changes from deal to deal but Chadda explains that the makeup of funding is one of the biggest differences from when he joined the company 20 years ago. Now, when Chadda goes on roadshows with TMX to promote the exchanges to international audiences in places like London or Zurich he says it is very well known for its relationship with mining companies and the opportunities it offers new and existing issuers. Particularly on the venture board where prospector companies are coming in without an actual mine and asking for funding on research and exploration, having a credible and thorough issuing process is absolutely critical. Chadda’s priority, in a role he shares with chief client officer Shaun McIver, is to create an environment where the right pools of capital can meet the right investee company and to do that he sees himself as a matchmaker. TMX’s strategy is divided into a plan by sector and a plan by geography. In application, it’s building high quality pipelines of customers on the corporate side while ‘surgically targeting’ appropriate funds globally that will best match the pipelines. The Canadian ecosystem again comes into play here, with Chadda and TMX working closely with local brokers, lawyers, existing listed companies and other players to identify spin out or merger opportunities. The team assesses the ‘value proposition’ for each board when it is determining the level of capital that would be attracted to a certain listing. For example, with the average size of financings on TSXV around $2.5 million, it is unlikely that figure would meet a large Asian fund’s value proposition. Conversely, when Chadda is looking for an international financier for a new issuer he leads with the junior end of TSX with regular financings upwards of $40 million. The mining industry on a global level has gone through a difficult period with a somewhat catastrophic commodity price downturn afflicting companies of all sizes in all jurisdictions. However, in the last year or so it appears there is light at the end of the tunnel as investors return to the market and seek capital for new projects or expansions begin to flow again. That movement has been reflected on TSXV, which has seen strong growth from the budding lithium sector over the last year, but Chadda says mining growth is now more widespread and stable.